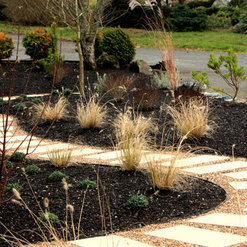 The cost range above is for landscape installation, not landscape design services. 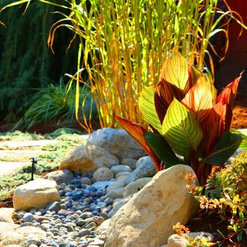 Landscape Design services typically cost $800 - $2,400 depending on the size and scope, and are a separate scope of work from landscape installation. 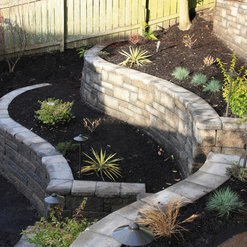 Landscape installation projects have a wide range as the scope of work can vary greatly. A range for installation is $15k - $125K. When we finally decided to tackle our backyard after decades of talking about it, we interviewed several people to find the right fit for us. Within a few minutes of meeting with Jordan from The Sculpted Earth, it was clear he was the one, and we couldn’t have been more right. Although small, our backyard is our favorite place to be. After replacing our old, elevated deck with one at ground level, we really liked the feel of being more surrounded and “submerged” in our garden. We loved the idea of a little sanctuary filled heavenly scented flora, with birds and squirrels and butterflies flitting about, but the yard was in a sorry state. And being surrounded by neighbors on all sides wasn’t the most conducive to privacy. Jordan listened to all of our thoughts and came back with a design addressing all of them. He was great to work with, always supportive of our ideas, even when different from his own. We really appreciated his artistic sense, much appreciated sense of humor and seemingly endless patience. He and his coworker, Andy, worked everyday, often in frigid, wet weather during our cold and snowy winter, and were always good-natured. Other ideas came up during the process and we made some big changes because of these and one year later, we’re so glad we did. We now have beautiful stone slab walkways surrounding our deck, a nice pathway throughout the garden and a great stone slab patio off in one previously unutilized corner. He built and installed some very cool trellises along the east and south borders of the garden, now covered with fragrant vines, and we have a nice, well contained berm of several species of bamboo along the west side, providing us privacy on all sides. Between our several bird feeders and a newly installed small water feature, our garden is continuously visited by a multitude of birds year round, and by butterflies and dragonflies in the summer. And the new underground watering system is a godsend. When the job was finished a year ago December, the yard appeared and felt half again as big, and everything looked nice and tidy but rather bare. But come spring, it quickly began to explode with colorful growth and within seemingly moments, we found ourselves surrounded by the gorgeous, lush, heavenly scented garden filled with birds and squirrels and butterflies we had hoped for, and then some. We couldn’t be more pleased and would happily work with Jordan again! Jordan and Sculpted Earth was great to work with. My husband and I had a portion of the yard that was overgrown with bamboo, rocks and plenty of weeds. Jordan's team came in, ripped it all out and replaced with a lovely patio and sitting wall. Jordan had great ideas and suggestions whenever we were not sure what to do. He and his team worked quickly, we were amazed at how quickly they cleared the area. The care and attention to detail with the install was also great, making sure the border of the pavers lined up well with existing concrete so you wouldn't catch your foot. Jordan's team also took the time to cut into and existing wall and notch out space for a drain pipe coming from the house. We appreciated the work he put into making everything look great. It did take a bit of time to get on his schedule once we got an estimate, but it was worth it. The Sculpted Earth did a fantastic job on our yard, beating our expectations! Jordan put together a multiphase plan with estimates. He carried them out perfectly while staying within our budget. Once our project started we had a dedicated crew 5 days a week until project completion. Jordan and crew would also check in with us periodically to make sure we were happy with the progress and to seek feedback. Jordan and crew are great to work with. We had a construction drawing going into our project, but there were some inaccuracies in the design that required frequent adaptation as the work proceeded. Jordan does a good job communicating, has good design suggestions, and stayed flexible throughout the project. His pricing is fair, and he & his crew are very considerate of neighbors when it comes to the the noise and mess these projects can bring. We would hire him again. Thank you so much for the review. Glad we could help. I cannot say enough wonderful things about The Sculpted Earth. We hired Jordan Hershman and his team for a complete overhaul of our backyard this past summer, 2018. Jordan was great at taking what I was envisioning and making it a reality! He and his team were very professional, friendly and quick to respond to me. I would highly recommend The Sculpted Earth. Thank you for the kind words. So glad you love your new space. Jordan worked with us to do a full redesign of our front yard area. He and his team removed the retaining wall, moved our giant boulders and built a new rockery, installed a beautiful raw stone staircase and added flagstone landings. He was communicative, collaborative, professional and his team did a great job. Prices were fair, even recommending that we visit the stone supplier directly to understand costs and our options. 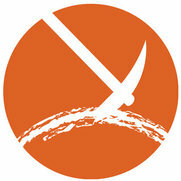 I would recommend working with Jordan for your next hardscaping project. Jordan and his team at The Sculpted Earth did an excellent job of jumping in and saving us from a DIY disaster! 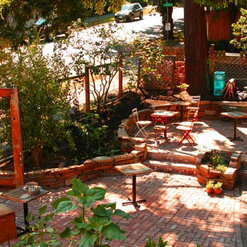 We thought we could install a flagstone patio ourselves and quickly realized we were in way over our heads. The Sculpted Earth team got the job done quickly and the end result is 10x better than anything we could have done on our own. Excellent job and we will be recommending them to our friends! Thank you for the great review Dale! 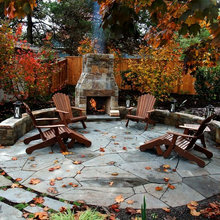 We're glad to hear you're happy with your new flagstone patio and the service we provided! Great experience! We love our new backyard! 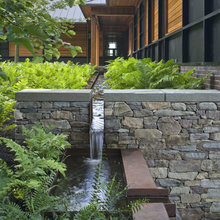 We went from the design process thru the demolition and excavation and installation. Jordan was very knowledgeable about every aspect of our landscaping. We had a bulkhead replaced and fence installed on top. We used pavers for our patio. We had a screen fence put into the landscaping, along with plants and trees, a water feature, and irrigation. Jordan worked along side his workers on all parts. Jordan gave us ideas and recommendations along the way. He takes pride in his projects so good quality is there. He listened to us and made sure we received what we wanted. A very professional and friendly guy! Project took awhile because of winter weather, but it was worth the wait. Stayed within the budget, except for a few change orders we instigated. Thank you so much for your review Becky! 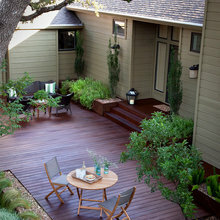 I'm happy to hear your new outdoor space met all your expectations and then some! Jordan was a gem to work with, very patient ,polite and accommodating even when I changed my mind several times. 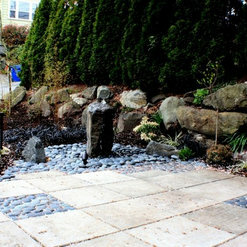 Jordan put in a 20 by 20 cobble stone patio ,parhway and sprinkler systems, you are welcome to come by and take a look. I was very happy with his bid which was lower than other company's . I highly recommend The Sculptured Earth. Dorothea Harding. Thank you for your kind words, very much appreciated, it was a pleasure working with you! A second installation by The Sculpted Earth has again surpassed our expectations. Both are so meticulously staged and add such a welcoming and defining destination for those who approach the areas. 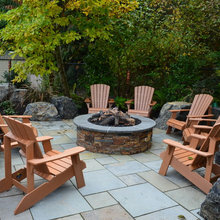 The most recent installation is an oval gathering area (built into a hillside) for enjoying the surrounding trees and nature. 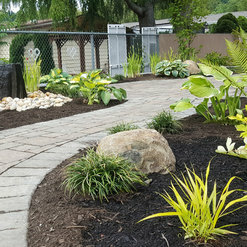 It was well integrated into already existing landscaping of 30 years ago, augmenting the past with a visually subtle, yet dynamic new area of relaxation in our yard. Thank you so much for nice review, very appreciated, it was a pleasure working with you! Jordan at The Sculpted Earth is great to work with. He is professional and resourceful. 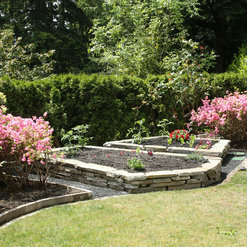 Our rock wall was transformed from a mess of weeds to an attractive backdrop to our yard. Highly recommended! Many thanks for your good review, we appreciate it a lot! We found The Sculpted Earth (and Jordan) early last spring through a referral when we were looking for a landscape design firm to rebuild our backyard retaining wall. Jordan made the whole process easy from the very beginning. He was very interactive and helpful when we sat down to discuss what we wanted to accomplish with the project. To help us visualize the end result, he presented us with a number of great design options. After selecting our desired approach, he promptly provided a competitive quote and references and we ultimately signed the contract and scheduled work. Our project was complex and presented some unforeseen challenges along the way. For example, when regrading our backyard, Jordan found a buried structure that required us to alter our design mid-project. Jordan quickly responded by drawing up new options to help us work through the challenge and make a decision. Jordan's communication throughout the entire project set him apart from other contractors we have worked with in the past as we always knew where we stood. He was also easy to work and very reliable throughout the entire project. We absolutely love the end result - Jordan's design flows well into the rest of our backyard and gave us an amazing space to relax and entertain. We would hire him again for any future landscaping design needs. John, thank you very much for your review and feedback, very appreciated!